It should go without saying that I love my boyfriend. Mike is wonderful. He gets me, most of the time, and we both have a lot of the same strange things in common. This isn’t a post about why I love him, though. That’s private. As smart and wonderful as he is, sometimes he says weird things that I do not understand. Or sometimes he says funny and terrible things that are awesome. I feel like Things My BF Says could be a regular feature. The other day, I was pouring a glass of water and he sees me and calls out “DON’T DRINK ALL THE WATER!” I was getting water from the Brita pitcher, which is filtered tap water. We’re not going to run out. The water comes from the sink. 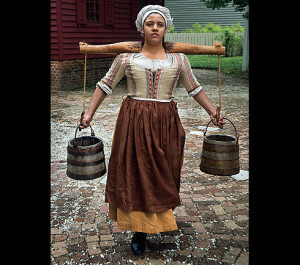 If I do “drink all the water” from the pitcher, no one has to carry two buckets on a stick down to the well. It’s right there.